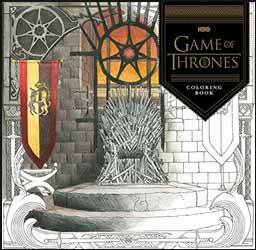 Colouring books for adults are a huge thing at the moment and what better gift for the Game of Thrones (GoT) fan in your life than this GoT adult colouring book. By "adult" I don't mean there are breasts and genitalia thrust in your face, like the show, more that this is a more intricate, mature themed colouring book than the ones aimed at children. It can be used in numerous ways. You can use it as is: a book with pictures to colour. Or you can photocopy the pages so that you can paint on them without ruining the images on the reverse side. Or you can scan them into your computer and then colour them digitally. Whatever your preference, there are plenty of colouring options available. The book features highly detailed illustrations of beloved characters, beautiful settings and memorable scenes. Relive pivotal moments and celebrate favourite characters from the past seasons via 35 detailed black-and-white images on 60 pages of high-quality paper stock, suitable for pen, pencil and watercolour. Jon Snow with his direwolf Ghost, Sansa Stark, Daenerys with the Unsullied, Arya with her sword Needle, Joffrey on the Iron Throne, The Red Viper, Sandor Clegane, Brienne of Tarth and more. Most of the scenes are represented as expansive, two-page spreads including Daenerys escaping on Drogon, the Night King at Hardhome, a map of Westeros and Essos and the Battle of The Blackwater.